Paul’s available to do some work during August, and there’s the usual beard-tugging, sucking of teeth and considered conversations as Steve and he discuss what to do about the rudder tube, and queen plank over the counter stern. It’s all agreed and Paul starts work. As we depart for Cowes, and the final OGA Anniversary celebrations, August 2013, Paul continues working on the rudder tube, and we leave the van safely stored on Jo and Paul’s drive. We’re going back to Derbyshire from the Isle of Wight, for a couple of weeks at home. Returning to Woodbridge in September, it looks like the weather’s set fair for us to carry on working for a couple of months. With the tent open on all sides, and the hull pretty well fair, its time to sort out the sheer. After careful skimming with the plane, Steve and James (who’s popped by to see how we’re doing) keep taking another look, just to be sure, and the starboard side is done. 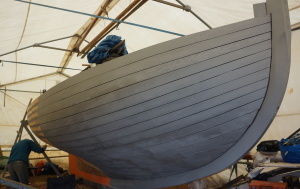 With more good weather forecast into the Autumn, we’re on track to get the hull painted to protect the wood over winter. 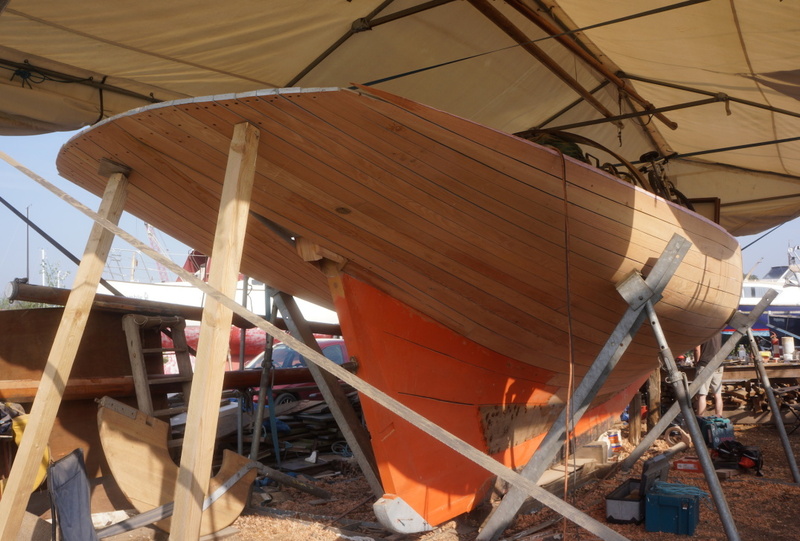 While we were in Cowes, Paul finished the rudder tube and now its time to fit the queen plank. There’s lots of discussion about how to ensure the ‘slope’ is right for the deck over the counter to drain properly. 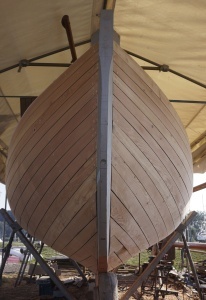 With a final check of the hull, there’s a few more bungs needed to be made, and glued in place. It’s an important job, to get the sheer right, and difficult to judge. So we enlist the help of Trevor and his brother this time, to help get the line just right on the port side. Henry the vacuum cleaner has been a permanent resident in Woodbridge this summer in an attempt to keep on top of all the dust and woodshavings. Once the hull is ready, Beverley helps with cleaning it down, ready for painting with yacht primer. Take a last look at the lovely wood, before the paint goes on! As the weather becomes more autumnal and the days get shorter, its time to go back to Derbyshire for birthday and anniversary celebrations. 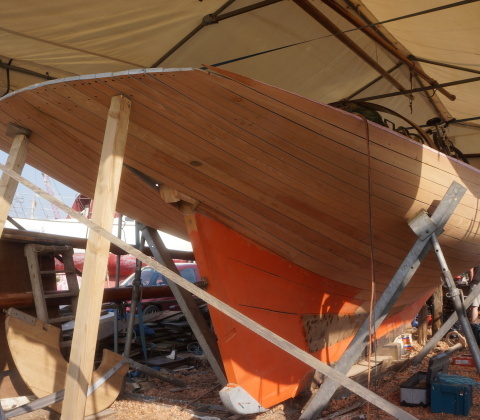 It’s been a good year for both sailing and boat building, we did some sailing, joined the OGA50 celebrations and managed to get the hull painted as planned. But there’s some bad news, the tent is beginning to show its age. The battering it’s had over the past six years has worn the fabric in the roof. 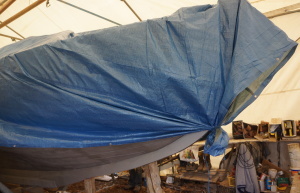 Now the hull’s got no drainage holes, the last thing we want is for her to fill with rainwater, so its off to buy more tarps for laying up this winter, and we create a ‘tent within the tent’ for ‘Cachalot’.